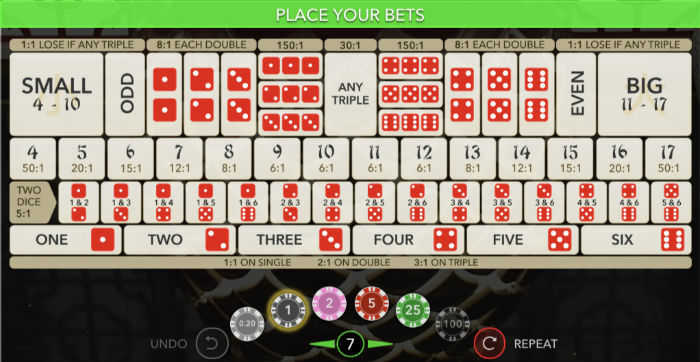 There are a few live dealer sicbo tables from different providers to choose from. Evolution Gaming’s just launched Super Sicbo adds to that list and it comes with a twist. That twist is random multipliers applied to the various bet options, offering the potential for super-.sized payouts. More on that below. For those unfamiliar with the game of sicbo, think roulette but with dice instead of a wheel and ball. Rather than betting on what number the little white ball will come to rest on, you are betting on the outcome of the roll of 3 die. First you place your chips on the bet selector. As in roulette the different bets offer different payouts which roughly correspond to the probability of that outcome (with a little house edge worked in there of course). Once bets are closed the die are rolled, typically inside a glass enclosed trampoline contraption, and winning numbers revealed. You play Evolution’s Super Sicbo as you would any other sicbo table. While bets are open you simply place your chips on the very easy to understand bet selector. The bet selector clearly displays the payout for each bet type. It also graphically explains each bet type quite clearly. These are the regular payouts before any random multipliers are applied. And to be fair, they are not that different from the payouts you find on other sicbo tables. As a comparison, below are the payouts on Opus Gaming’s sicbo game. Evolution Super Sicbo offers a reduced payout of 15:1 on the three dice total 6 or 15 bet. It offers a better payout on the three dice total 5 or 16 bet. The one other difference…on Super Sicbo you lose on any triple with the even money bets (Big, Small, Odd, Even). Otherwise, all other payouts are the same. With random multipliers being applied you’d expect some more severe crimping of regular payouts to compensate (ala the reduced 29:1 straight up payout on Lightning Roulette). No complaints this hasn’t been done. Once bets are close, a random number of bet options are selected (in gold above), and random multipliers are applied to them. These override the regular payouts. So, in the above example, had you bet on a three dice total of 7, and that was the outcome, you would receive a 20:1 payout rather than 12:1. Had you bet on triple 1’s, a mouthwatering 888 to 1 payout would be coming your way. The optimal theoretical return to player percentage for this game (taking Big/Small/Odd/Even bets) is 97.22%. The RTP range for all bets is 97.22% to 95.02%. Took a few rounds to win a bet with a multiplier applied, but it did eventually come. Scroll to the last game here for a hit on number 9, with a 25x multiplier applied! Leo Vegas were one of the first casinos to launch Super Sicbo. No doubt all the majors will soon follow. We’ll keep track of which casinos add Super Sicbo here in the forums.